Editor’s note: This interview took place in July. Virginia Caldwell passed away Aug. 23. When we think of Kansas, we are reminded of The Wizard of Oz, Dodge City and the great Kansas University basketball teams, which included Wilt Chamberlain. Kansas also gave us the late Virginia Caldwell who served 31 years —1963 to 1994— in the Air Force and Air Force Reserves. She was a native of Kanopolis, Kansas, a town in the center of the state, and one of 10 children. Her parents emigrated from Mexico in the early 20th century. Growing up during the Great Depression and World War II gave her a sense of self-preservation and responsibility, as well as independence and toughness, she had often said. She felt she had a calling for nursing in her younger years, and went on to earn a bachelor’s degree in nursing from Marymount College, Salina, Kansas. She moved to Tucson, Arizona, in 1966 and earned a master’s degree as a nurse practitioner from the University of Arizona. Caldwell worked at a number of hospitals in Kansas and St. Louis, Missouri, which gave her experience in areas of nursing to include surgical nursing and research. However, she said she felt a higher calling to serve her country, so she started a career in the Air Force and Air Force Reserve as a military nurse and nurse practitioner. She was assigned to various Reserve and active-duty units. Her career began in early September of 1963 when she was commissioned as a second lieutenant. She retired as a lieutenant colonel 31 years later in late September 1994. Her principle service was at Davis-Monthan Air Force Base and Luke AFB with other assignments sandwiched in, including a deployment to the Middle East as part of Operation Desert Storm in 1991. 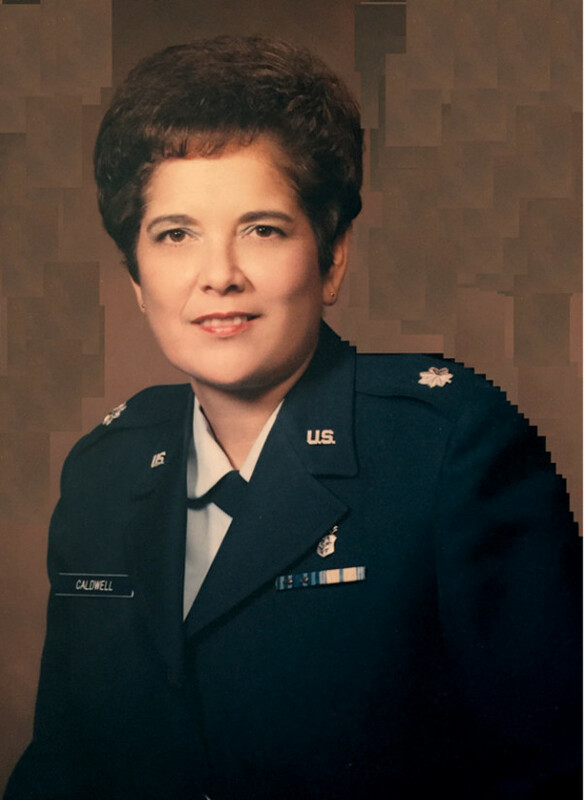 Caldwell served at Luke from 1972 to 1978 as a captain in the Reserve and finished her military career at Davis-Monthan. She was the chief nurse for her final decade there. One of her assignments was as a Category B Mobilization Augmentee at Little Rock AFB, Arkansas, as a nurse practitioner from 1978 to 1980. While serving at Little Rock, she was busy on the civilian side working for the Arkansas Department of Health and teaching at North Arkansas Community College. One of her fondest memories of her time there was meeting future president, Bill Clinton, who was governor at the time. Caldwell had a deep sense of history and an appreciation for military parks and cemeteries. While living in Kansas, she visited the home where President Dwight Eisenhower grew up. She often talked about her visits to the Tomb of the Unknown Soldier at Arlington National Cemetery. Her service outside the military and her profession was plentiful. Caldwell was involved with The American Cancer Society, The American Heart Association, The Cub Scouts of America, the Mayor’s Task Force on Aging, Tucson, and the Air Force Association. She was a strong believer in community service. Another deep love of Caldwell was politics. She really emphasized the importance of voting and holding elected officials accountable. Her commitment in this area led her to get involved with legislative committees such as helping to get a kindergarten bill passed in 1971. She also worked with numerous politicians to get legislation passed. Military service didn’t stop with Caldwell. Her son, Bill served in the Marines in the 1980s. She loved spending time with her son and her two grandchildren. In her final days last summer, Virginia never let her illness ruin her optimism or her outlook on life. She always felt there was something good over the next hill.